Petra is pleased to announce that final land development approval has been received from the Phoenixville Borough Council for the development of SteelTown Village (STV). On Wednesday, March 15th at the regular Borough Council meeting, the Council voted in support of STV. STV is a 48 unit development providing affordable housing for individuals and veterans with disabilities, elderly and workforce families. The 1, 2 and 3 bedroom units will be constructed as 3 story walk ups over flats. All the accessible units will be on the ground level and all units will have private entrances. Additionally, the development will have a community room and a fenced out-door play area. Groundbreaking is expected to occur this Spring after the remaining governmental approvals are received. Interested individuals and families can get on the STV interest list under Potential Tenants. 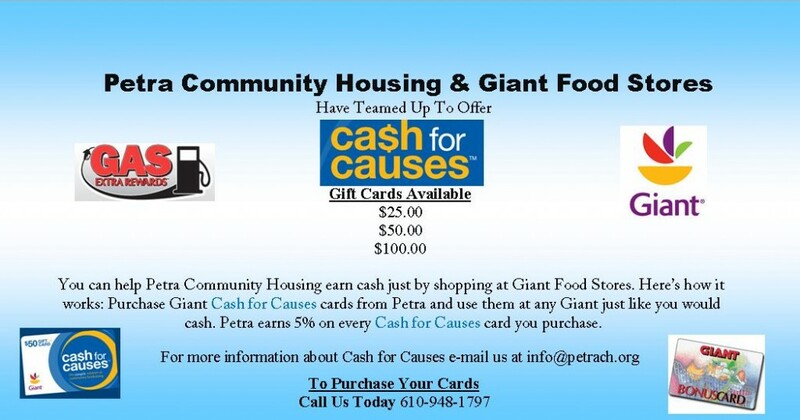 Petra Community Housing has joined with Giant Food Stores to offer Cash for Causes. By selling Giant gift cards for face value, Petra earns 5% of each card sold. Petra has been participating in the program for four years. During that time $5,000 has been raised to support the Petra on the Go Transportation program.